Rabbit anti Human, Mouse BMF. 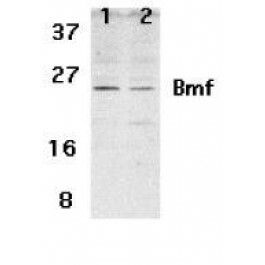 Western Blot: Bmf antibody can be used for detection of Bmf at 2 μg/ml. HepG2 or 293 cell lysate can be used as a positive control and a band at approximately 25 kDa can be detected. 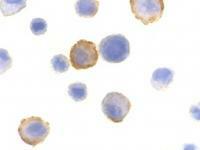 Apoptosis is related to many diseases and development. Members in the Bcl-2 family are critical regulators of apoptosis by either inhibiting or promoting cell death. Bcl-2 homology 3 (BH3) domain is a potent death domain. BH3-only proteins, including Bad, Bid, Bik, Hrk, Bim, Noxa, and PUMA, form a growing subclass of the Bcl-2 family. A novel BH3-only protein was recently identified in human and mouse and designated Bmf (for Bcl-2-modifing factor) (1). The BH3 domain in Bmf is required both for binding to Bcl-2 proteins and for triggering apoptosis. In healthy cells, Bmf associates with the dynein light chain 2 (DLC2) component of the myosin V motors and is sequestered by the cell's actin cytoskeleton. Disruption of the actin cytoskeleton, either by depolymerization of actin filaments or by detachment of cells from the extracellular matrix, triggers release and activation of Bmf, initiating the downstream apoptotic program (1,2). Bmf is constitutively expressed in many tissues (1,2). Puthalakath H, Villunger A, O'Reilly LA, Beaumont JG, Coultas L, Cheney RE, et al. Bmf: a proapoptotic BH3-only protein regulated by interaction with the myosin V actin motor complex, activated by anoikis. Science. 2001 Sep 7;293(5536):1829-32. PubMed PMID: 11546872. Hunt A, Evan G. Apoptosis. Till death us do part. Science. 2001 Sep 7;293(5536):1784-5. PubMed PMID: 11546862. PBS containing 0.02% sodium azide. EndoG antibody was raised with a synthetic peptide corresponding to 15 amino acids near the amino terminus of human EndoG.